R etail fraud is one of the most common criminal offenses charged in the State of Michigan. Retail fraud is more commonly referred to as shoplifting. To prove a charge of retail fraud, the prosecution must prove several elements beyond a reasonable doubt. Aside from the value of the property, the elements of retail fraud are identical between first, second and third degree retail fraud. If the prosecutor can prove that the defendant took the property and that he or she moved the property, the prosecution must then prove beyond a reasonable doubt that the defendant intended to steal the property. Intent to steal means the defendant intended to permanently take the property from the store without the store’s consent. The incident must either take place inside the store or in the immediate area around the store and it must have happened while the store was open to the public. The last element the prosecution must prove is the collective value of the property in question. If the value was $1,000 or more, the charge is First Degree Retail Fraud, a felony, and the defendant can receive a sentence in prison. If the value was $200 or more, but less than $1,000, the offense is Second Degree Retail Fraud, a misdemeanor which is punishable by a maximum sentence of 1 year in jail. Finally, if the value is less than $200, the offense is Retail Fraud Third Degree, and the maximum possible sentence is up to 93 days in jail. The Michigan retail fraud defense lawyers with LEWIS & DICKSTEIN, P.L.L.C. 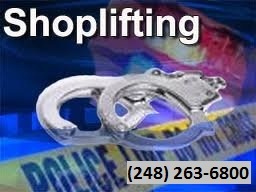 have handled several hundred retail fraud cases throughout Michigan. They have also represented a multitude of clients who were not citizens of the United States and are facing deportation because retail fraud is considered under immigration law to be a crime involving moral turpitude which can result in deportation. If you or a loved one is charged with or being accused of committing a retail fraud, call LEWIS & DICKSTEIN, P.L.L.C. at (248) 263-6800 for a free consultation with a highly experienced retail fraud defense attorney.